For hundreds of years, the people of the Danish Faroe Islands have been herding migrating pilot whales and other small cetaceans into shallow water and slaughtering them. Entire family units are destroyed, wiping out several generations of animals at a time. The Faroese claim that without the meat from these cetaceans, the people would starve. Whether or not people would have starved in the past without eating pilot whale is irrelevant. There is certainly no one in the Danish Faroe Islands who would go hungry today, much less starve, if no more cetaceans were killed. This "grindadrap" has no place in modern civilization. Even the meat of these creatures is dangerous to consume. The E.U. does not allow such activity, but the Faroe Islands manage to side-step restrictions with their overfishing and harm to marine mammals. I have traveled to the beautiful Faroe Islands today to publicly oppose the needless killing of intelligent, sentient pilot whales and other dolphins and to stand with Sea Shepherd and their 2014 Operation GrindStop campaign. It is important to understand we are not against the Faroese. We are for the whales and dolphins. We are their voice. But the eyes of the world are upon the Faroese today and it is now time to end this archaic abomination called the Grind. 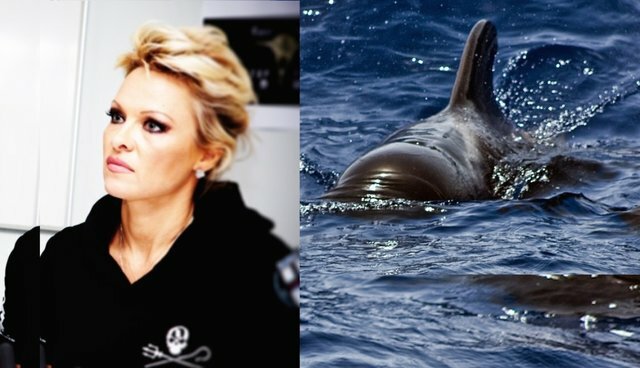 I support Sea Shepherd's efforts to end this cruel and ruthless massacre of defenseless whales and dolphins who are highly intelligent and so much like us. They have families like we do, they love them and care for them like we do, they have their own language and individual names for one another like we do, and a very complex social structure like we do. The killing is a stain on this pristine country which no longer needs the meat of these animals to survive. When we know better. We do better. And we now know that these are sentient creatures who suffer greatly not only during the slaughter but during the very stressful drive itself. On a panel with Lamya Essemlali, President of Sea Shepherd France. These slaughters are not for survival. There are very few things that happen like this, that are this brutal. We have to put this behind us and move on, and let the whales swim freely by. And I think it's much more important for us in the future to save our oceans and the biodiversity of our oceans, and to know that the whales are important too. They are very socially complex animals and their entire families are being killed in front of them in a manner that would never be permitted in any slaughterhouse in the world. In addition, the meat of these animals is tainted with toxic contaminants including mercury, which is particularly harmful to pregnant women and young children. Young people probably feel pressure to follow in the footsteps of their ancestors. I think this is the perfect time to not listen to your parents, to think for yourself. Maybe there's going to be a movement like there have been movements for many other things in the world where you look inside yourself and say "Is this something I should be doing just because my parents did it and my grandparents did it?" This is a new time and the world is at risk. I think this is the generation that has to stand up and say "That was then, this is now; this is what I'm going to do." I am fortunate to have some of my family with me today. They are surfers. What a beautiful eco-tourism destination these islands would make if only you would bring the grind to a halt. But until then the waters remain tainted with blood, staining the reputation of the Faroese. The time has come to stop the grind. Watch the whole Sea Shepherd panel here.